Spain, like all developed industrialised societies, is becoming more and more secular. Gone are the days when the Catholic Church dictated the rules of society, when government ministers consulted bishops in private when formulating legislation, and kissed their rings in public to demonstrate their piety. Religious feasts, on the other hand, remain an important part of Spanish society. The feast of the Assumption, which celebrates the belief — established as dogma only in 1950 — that the Virgin Mary was assumed body and soul to heaven at the end of her earthly existence, is a national holiday in Spain. For traditionalists, it is an occasion to publicly express their religious beliefs, but for most people it's a time for temporal rather than spiritual fulfilment. Like Christmas. 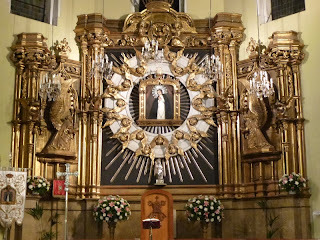 In the Latina district of Madrid the particular object of devotion is the Virgen de la Paloma (Virgin of the Dove), a painting with supposed miraculous properties. The painting is now displayed in an incredibly ornate frame, surrounded by angels and cherubs, behind the altar of a local church. Huge crowds throng the streets on the evening of 15 August. A steady trickle of devotees pay their respects by filing past the icon, some spending a few moments in spiritual contemplation. The majority prefer their spirits served on the rocks, mixed with cola in plastic beakers. And dancing to techno/pop/rock music in the surrounding streets seems more popular than praying in silence in the church. 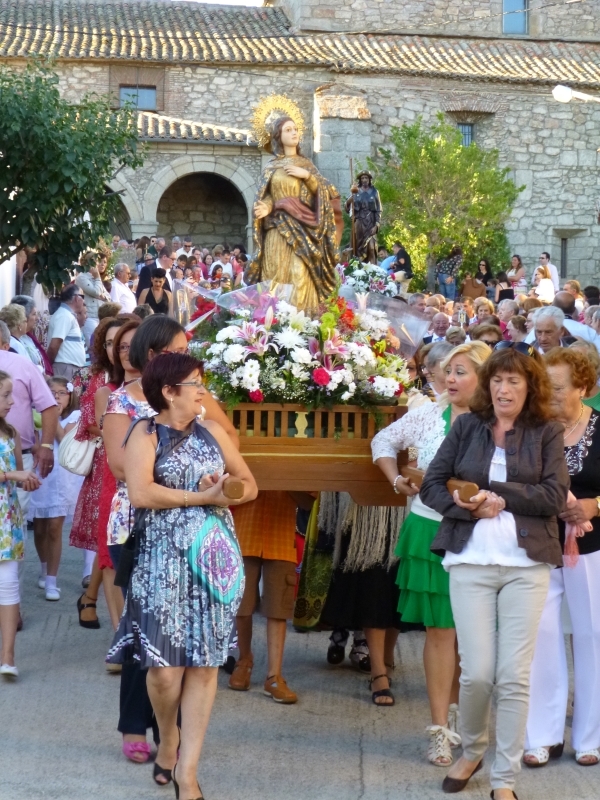 As well as the feast of the Virgin, every town and village in Spain has its patron saint whose feast is a time for celebration in in mid-August. 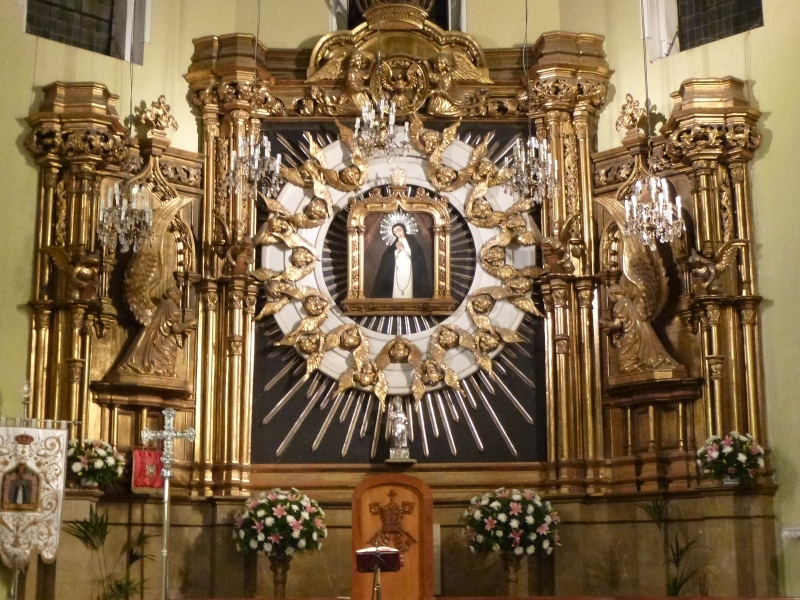 The patron saint of Puente del Congosto is San Roque (aka St Roch) whose feast is 16 August. Children who have grown up and left the family home return — many of them with their own children — to catch up with family and friends. The fiesta starts with an evening mass, followed by a procession through the village. 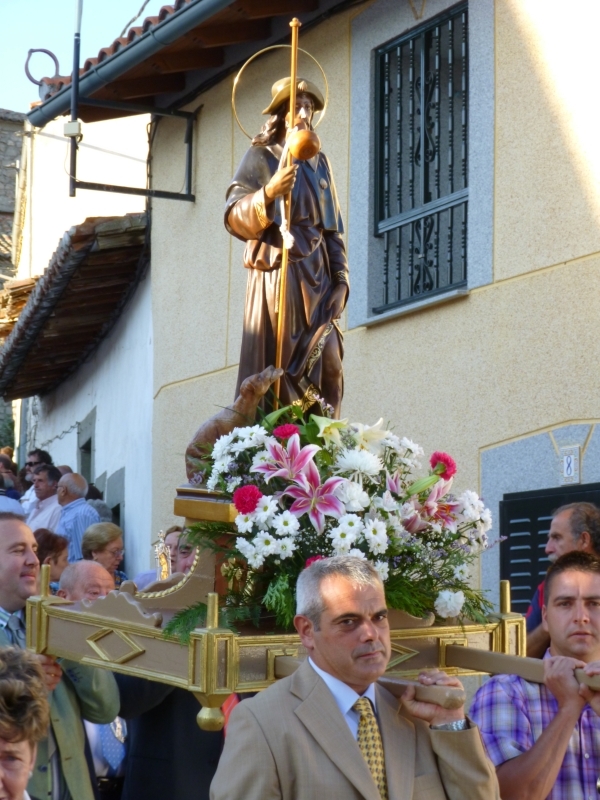 Effigies of the Virgin and San Roque carried aloft. Children in their Sunday best carry flowers and a band plays an interesting medley of religious and folk tunes. Traditionally the men walk behind the patron saint, the women behind the Virgin. The procession returns to the church and the population gravitates to the home of this year's host family where copious quantities of sangria and cakes are distributed. After late dinner, the street party resumes around the stage erected in the centre of the village and the music and dancing continue late into the night. 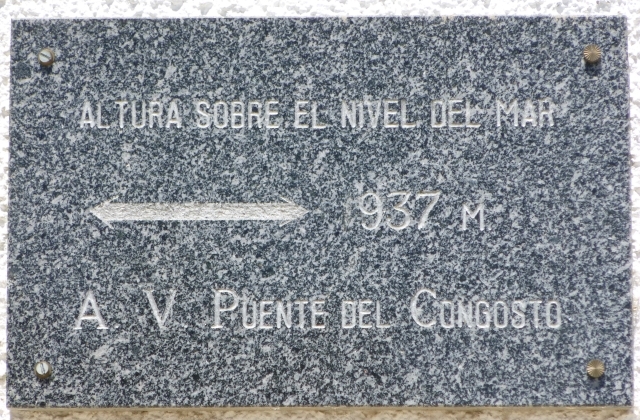 I've known Puente del Congosto — at the southern end of the province of Salamanca, in the foothills of the Sierra de Gredos, altitude 937 metres — since 1997 and have been made welcome there many times by two families I know well. I've seen the village at different times of the year, in the bitter cold of winter and the scorching heat of summer. I've seen the Rio Tormes as a torrent in spring and a trickle in autumn. Each period has its special charm, but the period around the Fiesta de San Roque is the social highlight of the year.